Each year, we try to gather a group of friends and/or family and head down to the Outer Banks for some fun, fellowship and food. 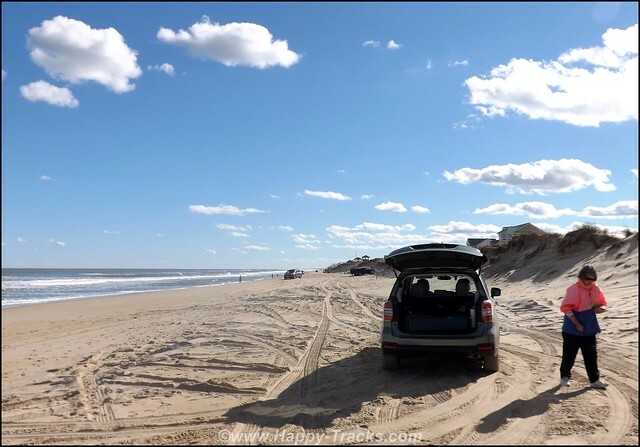 Usually, everyone who comes has a 4wd or AWD vehicle so that our fun includes some time riding the beaches of the Cape Hatteras National Seashore and north to the Currituck County beaches beyond Corolla. Our trip has expanded to five nights to take advantage of an off-season special rate at the Cape Pines Motel in Buxton. This year, thanks to an error in judgment, my truck was disabled and in the shop so all the vehicles were AWD Subarus! Friend Bruce (North Carolina) and his friend were driving his 2017 Outback, Neighbor Paul (Maryland) and his friend were driving his 2016 Forester and Betty and I were in her 2017 Impreza sedan. It should be noted that Betty made it quite clear that her Impreza would NOT be going on the beach, a wise call. 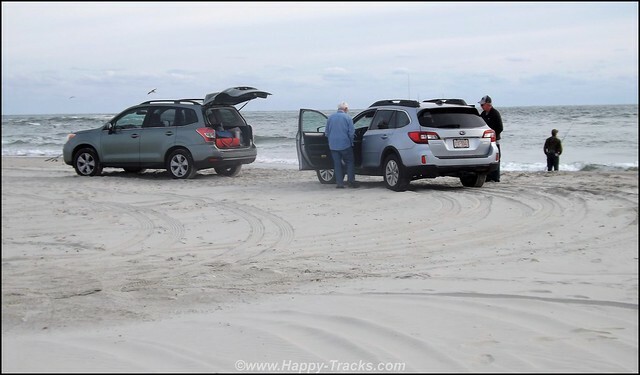 The Outback and Forester have the X-mode for better off highway traction plus the Impreza just does not have the ground clearance for when the sand gets soft and deep. We left home around 9:00 Wednesday morning and the traffic was surprisingly light with Paul and Carol following. We stopped, as usual, at the Waffle House in Ruther Glen, VA for breakfast. As we neared the 295 turnoff around Richmond, Paul followed the wrong red car off the exit ramp. We recovered and were back together by the time we got to I-64. A minor chuckle moment with no real consequences. The drive across the Monitor-Merrimac Bridge tunnel (I-664) was bright and sunny making for great views of the Hampton Roads harbor and the convergence of the James, Elizabeth and Nansemond Rivers. The bridge tunnel is named for the first ironclad ships which fought nearby in the Battle of Hampton Roads in 1862 as the USS Monitor and CSS Virginia (which had been rebuilt from the wreckage of the Merrimac). 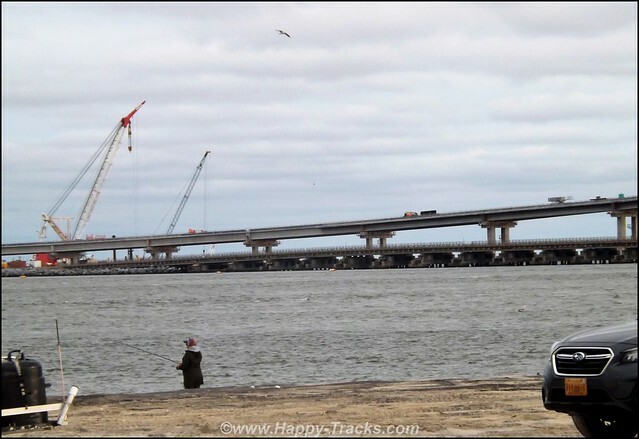 Local lore had once said that the Chesapeake Bay Bridge Tunnel, Hampton Roads Tunnel and Monitor-Merrimac Bridge Tunnel were built as tunnels so that an attack on the bridges would be unable to bottle up the significant Navy Fleet at Norfolk in port. Considering the size of the fleet (both numbers and individual ship size), drawbridges or very tall bridges would be disruptive to any hopes of road traffic or a security threat to the ships themselves as they passed under. We continued on past Suffolk, Portsmouth and Chesapeake reaching our next scheduled stop at the Border Station. Border Station is located on the state border between VA and NC, taking advantage of tobacco sales taxes in NC and lottery ticket sales in both states. Its also a good stop for reasonably priced gas and to stretch our legs. We crossed over the Currituck Sound on the Wright Memorial Bridge into Kitty Hawk blending with the Wednesday afternoon traffic rush. 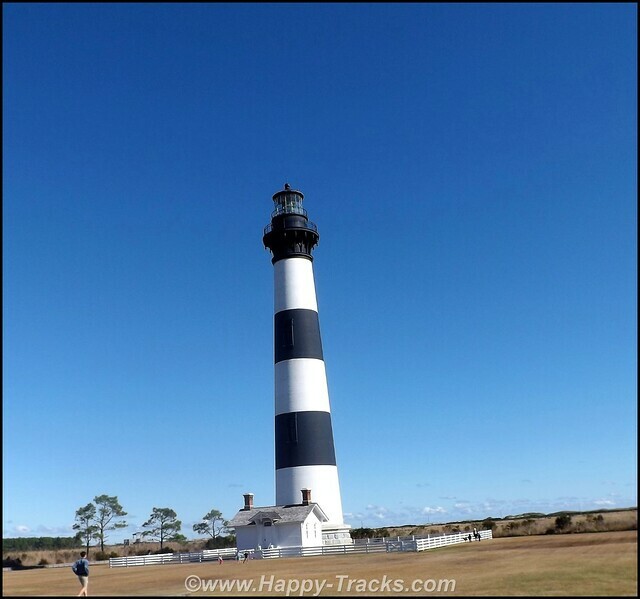 Some sights to see along the way, including the Wright Brothers Memorial statue marking the site of their 1903 flight, the old Putt-putt Golf castle poking its head up at Jockey Ridge, Bodie Island Light and arriving at the Oregon Inlet Bridge where the new bridge (to open in January 2019) looked substantially complete although some work still remained. This weekend would be our last time crossing the old 1963 bridge which is beyond its 30 year expected lifespan but survived throughout the numerous court challenges to its replacement. 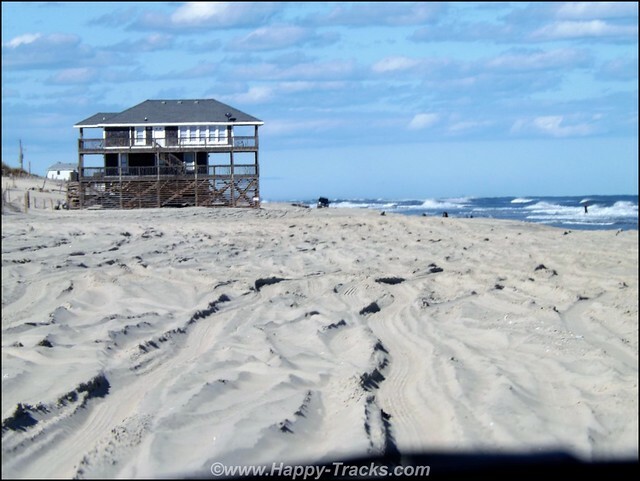 Just south of the Oregon Inlet Bridge is the Oregon Inlet Lifesaving Station at the north end of Pea Island National Wildlife Refuge, a portion of the Cape Hatteras National Seashore and Recreation Area. 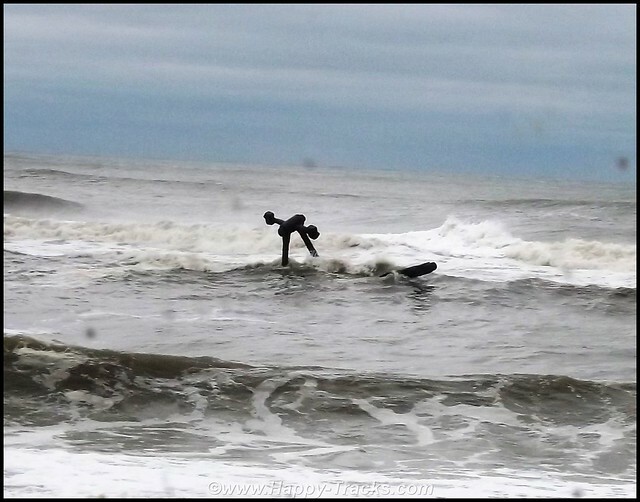 We continued south through the tri-villages of Rodanthe, Waves and Salvo on Rt. 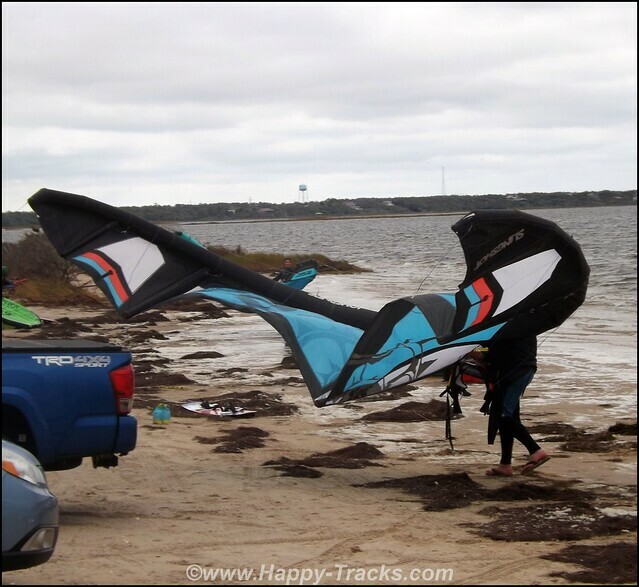 12 which follows the barrier island of Hatteras and eventually transits to Ocracoke via the ferry. Between the villages, low dunes lie to the east separating us from the ocean and scrub forests lie to the west separating us from the sound. 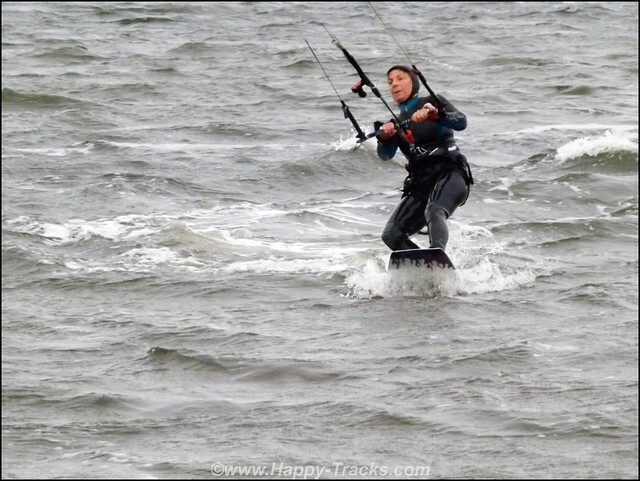 We pass Canadian Hole, so named for the Canadians who trek down for a long weekend kite-surfing and parasailing. We finally arrive in Buxton around 5:00 and find our accommodations at my favorite local motel, Cape Pines. Shortly after getting checked in and settled, we hear from Bruce who has arrived with his guest at the rental house in Frisco, just a bit further south on the island and located right on the sound. After we got those logistics, we met at the Diamond Shoals Restaurant in Buxton for our first get-together with introductions and food sampling. Based on the amounts eaten, sampling is probably not the right word but real fresh local seafood is a treat too long withheld. While not exactly a foodie roadtrip, a big part of our adventure is the consumption of much food and I’ll try to include the names of the restaurants. 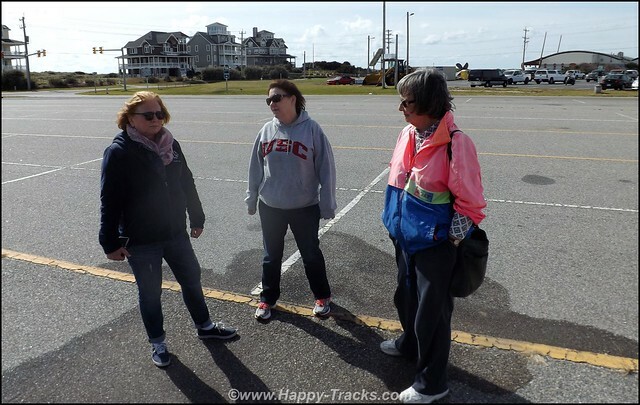 After a hearty meal and a couple of drinks, we all headed back to our respective lodgings with plans to meet at Diamond Shoals for breakfast before heading towards Ocracoke for the day. 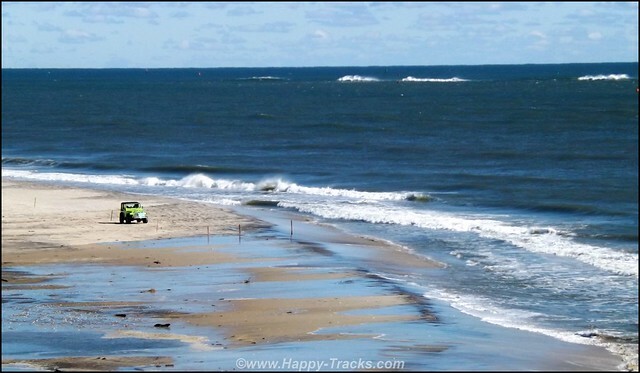 CHNS requires purchase of vehicle passes to drive on the beach which all had purchased before arrival. 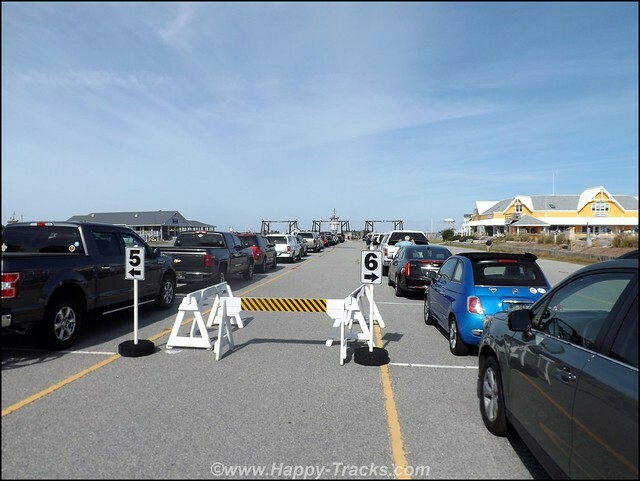 The trip to Ocracoke requires a ride on the free ferry from Hatteras although a passenger-only pay ferry is due to come online soon. This time of year, the ferry leaves each half-hour for the 75 minute ride to the northeast ferry terminal on Ocracoke Island. Depending on volume, you may have to wait for a while. This particular Thursday morning saw us waiting for the second ferry to leave but the weather and the company were pretty nice for conversation while we waited. 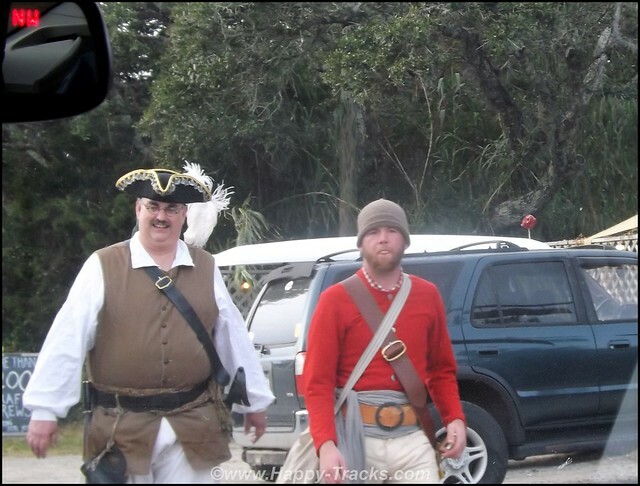 Part of the abnormally high traffic for that time of day and year is related to the Blackbeard Pirate Jamboree in Ocracoke that coming weekend. The ferry crew directs you on based on their optimal loading so we got split with Paul to port and Bruce to starboard. After the ferry gets moving, you can wander around and up to the passenger lounge for a better view. Every time we looked around, Bruce was still sitting in his car talking (Surprise! Not really.) 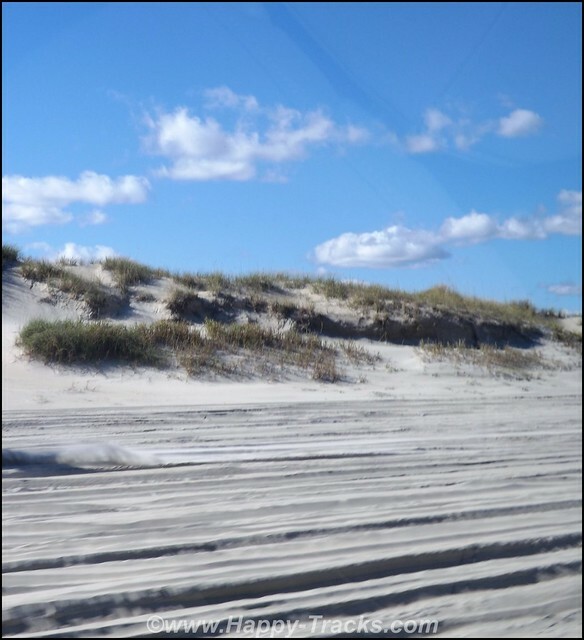 We enjoyed the ride and off-loaded in Ocracoke (to wait for a pilot car to take us through the hurricane dune and road reconstruction zone). But no Bruce? There’s nowhere to get off, where is he? In a few minutes, the crew walks over to his car and lifts the hood and he drives out to meet us. Turns out he was in the car talking because he’d gotten boxed in too tightly to get out of the car and so left the key on to listen to the radio – which also left his auto headlights on and pulled his battery down just a bit too much to restart. He’s always having adventures of some sort! Reunited, we headed southwest for lunch to Howard’s Pub, just past the airstrip. 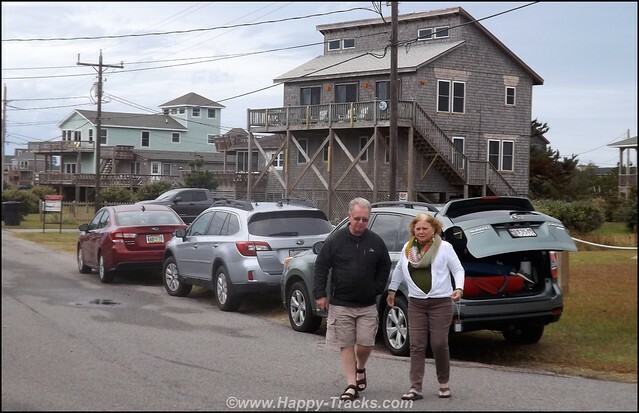 Howard’s is another favorite must-stop spot when visiting Ocracoke. In addition to great food and a wide beer selection, they have a second level open air deck to view the lower end of the island. The ladies went up to see the view while the guys tended to airing down and other things with the vehicles. After lunch, we turned across Hwy 12 to Ramp 72 to ride out to Southpoint, one of our favorite spots on the island. Southpoint Road is just under 2 miles of mostly graded dirt and sand which leads to the beach. An off-road permit is required for this area leading down to the beach. At the end of the Southpoint Road, you pass the dunes and the vista opens to the beach and the ocean. Breathtaking! 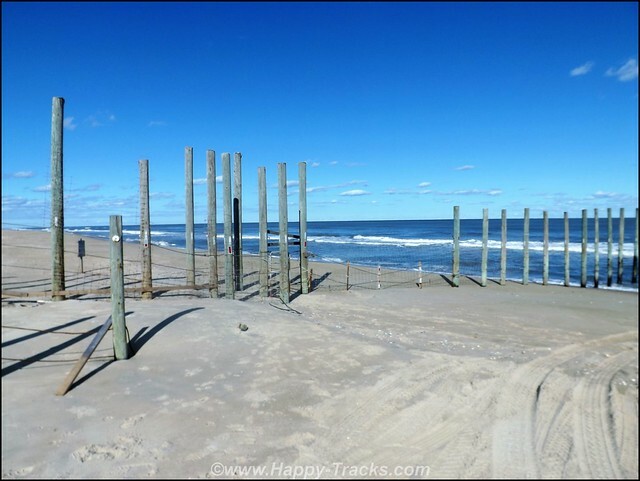 You turn right towards the point and drive past the fishermen and beachgoers through soft sand and hard pack. The soft sand here is why the Impreza stayed at the motel. But the view! We drove to the southern-most part of the point and parked. The view included boats coming and going, Portsmouth Island and the taller buildings in the village, fishermen, pelicans and other sea birds. 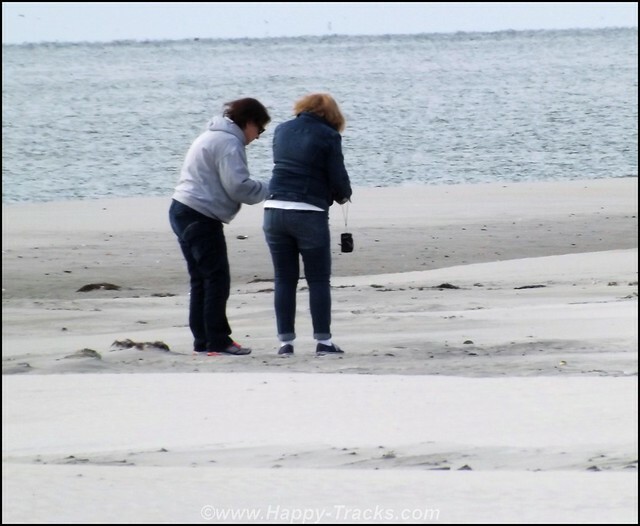 Carol had never been to the Outer Banks and spent some of her time collecting shells which were plentiful following the recent storms. 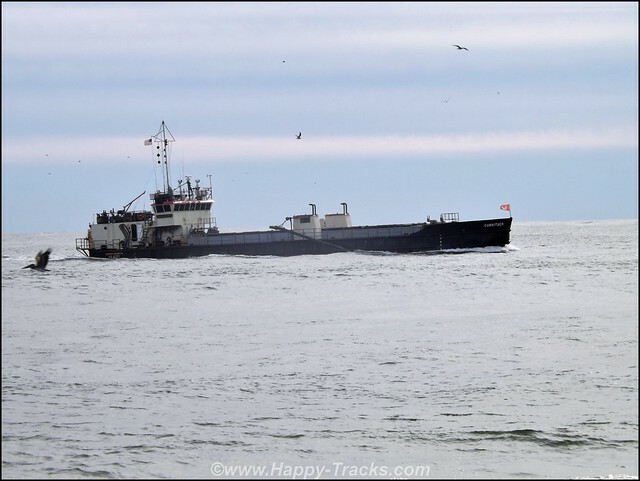 One of the boats we saw going by was a US Army Corps of Engineers Dredge. After a couple of hours just enjoying ourselves in the sunshine and breezes, we loaded back up with plans to cross back to Hatteras. Communications (and Bruce’s Adventurous streak?) led to the Forester heading into town while Bruce’s Outback headed towards the ferry. Since we were in town, we passed some of the Pirate Festival folk who remained in character, questioning what manner of witchcraft Carol was using in that (iPhone-shaped) box she kept pointing at them. 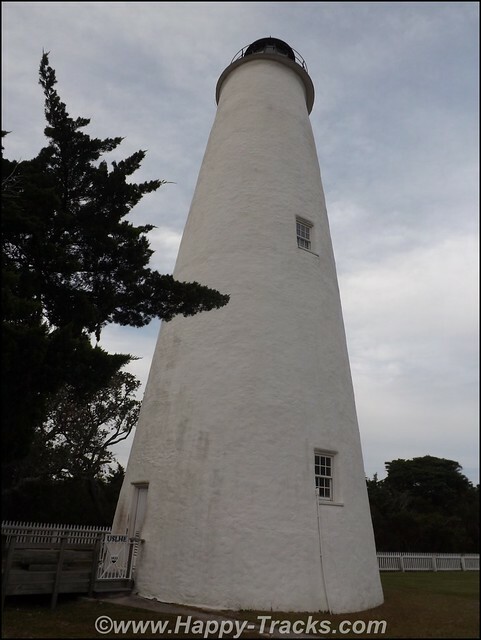 We also swung by the Ocracoke Light which we had seen from the point. We ended up on two different ferries and decided to just meet up in the morning. Paul, Carol, Betty and I decided it was a good night to dine at the Sandbar and Grille in Buxton. They went for the prime rib (over a pound!) split between the two of them. As we neared the end of the season, the beer selection was somewhat limited from their usual variety but it was more than adequate. Friday’s forecast had been for rain since before we left home and was getting worse every time it was refreshed. We started with breakfast at the Captain’s Table in Buxton. A favorite dinner spot but first time we had tried them for breakfast. Not bad, just not memorable. We’ll stick to going there for dinner. 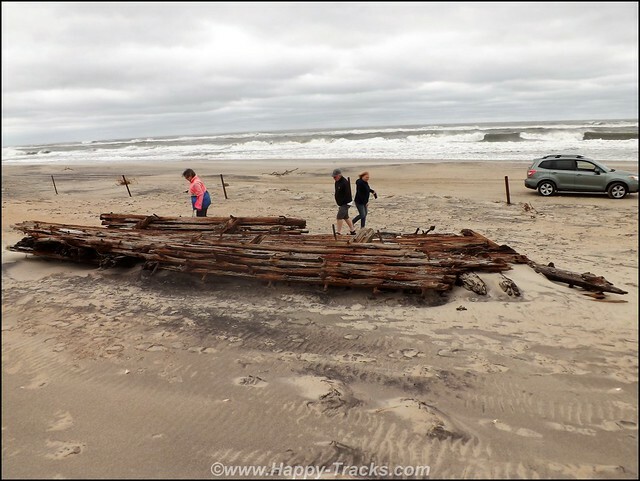 The predicted rain had not yet started so we detoured by Flambeau Road to get a quick look at the shipwreck there. 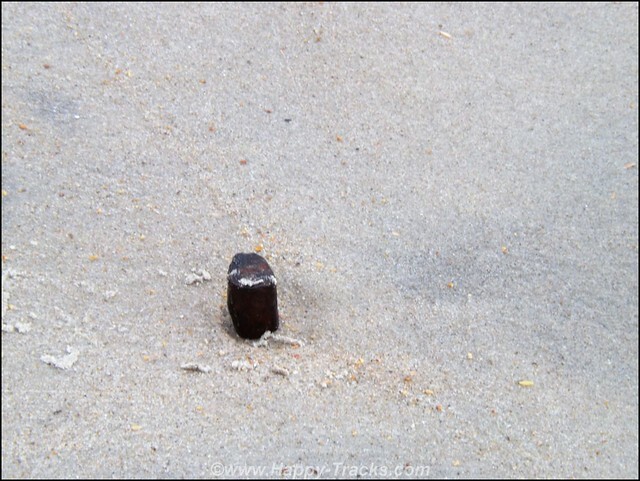 As sometimes happens, the sand had pretty much covered the entire thing and only one spike showing through a couple of inches. We had decided this would be a good day to visit the Graveyard of the Atlantic Museum, an eclectic collection chronicling the reign of Blackbeard, original settlement of the area, the involvement in early European settlement of North America, and participation in the War of 1812, the Civil War, and the two World Wars. 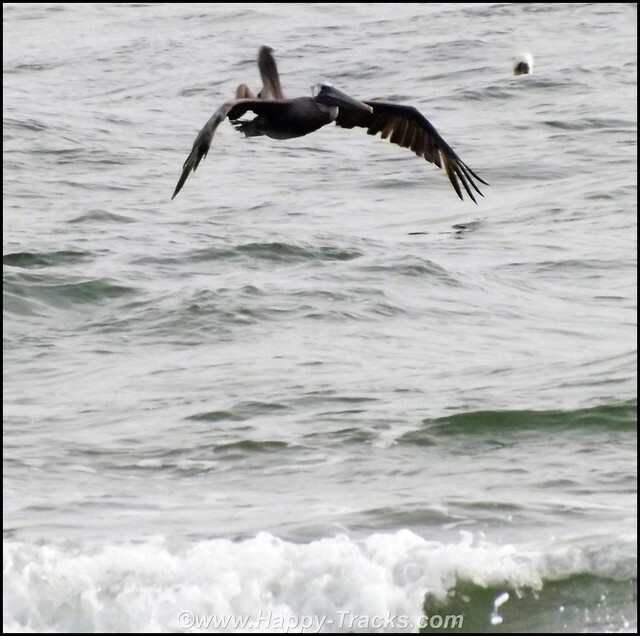 The area has a history of sportfishing, commercial fishing, and hunting going back 100 years and more. 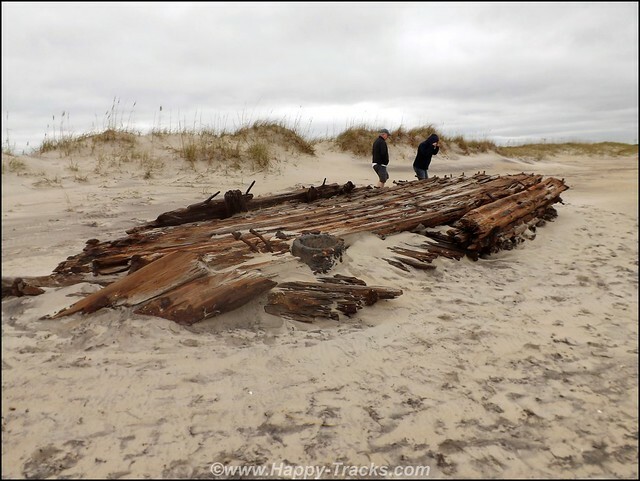 This is in addition to the long history as Graveyard of the Atlantic for the many shipwrecks around the Diamond Shoals which stretch out into the Gulf Stream. As you walk in the front door, the overwhelming display is a partial Fresnel lens from the Cape Hatteras light. During the Civil War, the light was disassembled and hidden in various places around the island to prevent its capture by invading troops. Other displays include several canvasback duck decoys. Wood was scarce on the islands so the locals developed a method of building hunting decoys using recycled canvas. While we were there, an artisan craftsman was working on making one and we got to watch him for a bit. 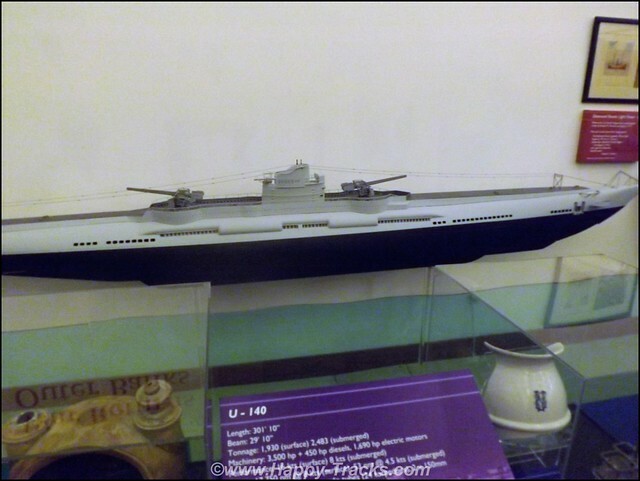 German U-Boat activity is well-presented in one display as are numerous bits of equipment and discussion of various diving systems and a display on the lighthouses. The local sportfishing industry is presented with several record catches and a bit of the history on the developing industry. Admission to the museum is by donation ($5 is suggested) and includes a gift shop. Also at the information desk that day was Mary Ellen Riddle, the Museum’s Education Curator and Volunteer Coordinator who answered some questions about a particular shipwreck we had spotted. 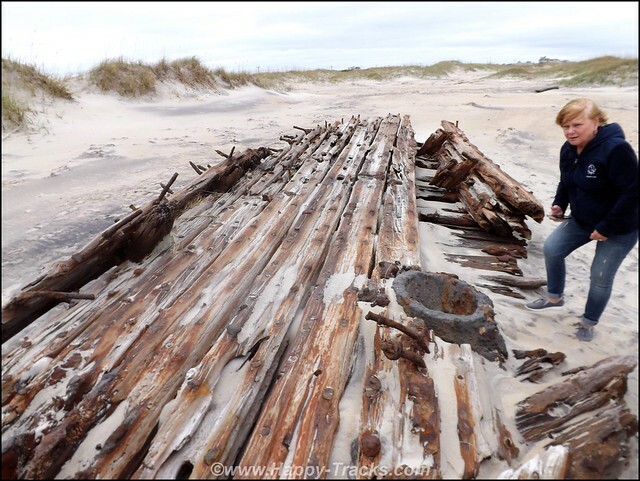 She also has a book on that subject, Outer Banks Shipwreck: Graveyard of the Atlantic. Signed copies were available in the gift shop. We were all invited to the beach house for dinner that night, provided we helped prepare so the remainder of the day was spent shopping and prepping under the watchful of one of the Carols. Delicious salad, spaghetti with a choice of meat sauce or a vegetarian sauce with garlic bread, Key Lime pie and a selection of wines severely blunted the effects of the cold rain blowing outside the windows. We were joined at dinner by friends, Richard and Becky, she’s a local wildlife rehabilitator and he is involved with the local rescue squad’s communications systems. The wind-whipped rain did make the drive back to our motel exciting though. Saturday morning dawned dry but still cloudy, a fine day for touring by car. Bruce and friend decided to spend their time clearing out the beach house while the rest of us decided to take the tour option. 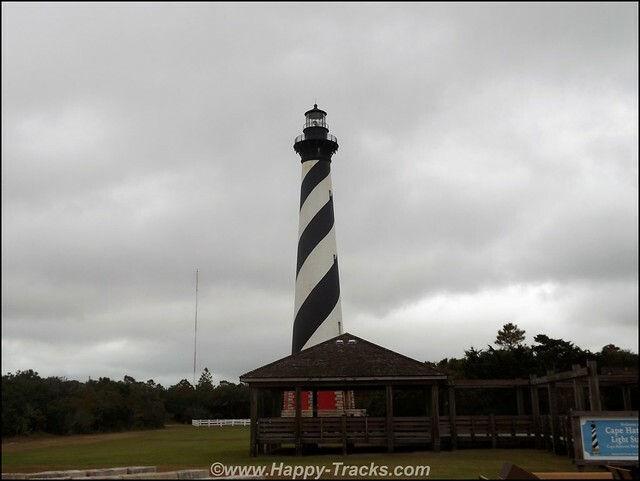 We started out at the Cape Hatteras Light, Cape Point and the old Ligthouse beach. Next, we headed back by the museum and went out Ramp 55 towards the point. 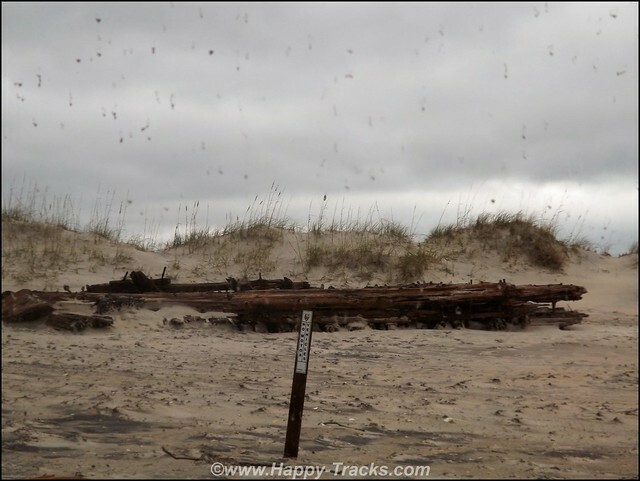 We looked for the Ramp 55 wreck (several theories but no conclusive decision on what it was or when it wrecked) which is sometimes visible in the narrow beach between the dunes and the ocean. We managed to find it back behind the first row of dunes, not sure whether the dunes had moved or if it had. In any event, it was very much exposed and visible. We got out and walked around and took pictures and more pictures. It was exciting for us, with the part we’d asked Riddle about clearly evident. Back in the car we cut back to the pole road which follows the powerline poles leading to Ocracoke off the end of the island. 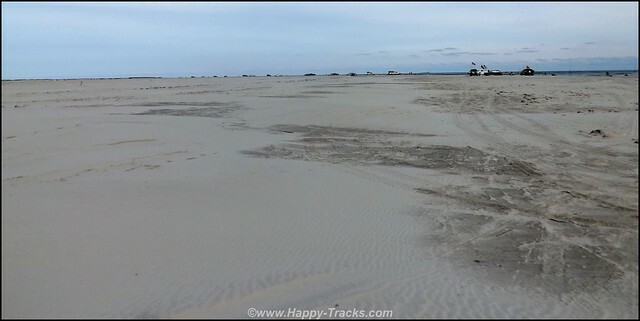 We wound up at the tip of the island and noted the road ended sooner compared to previous years (as did the island) with less shallow sandbar extending into the inlet. 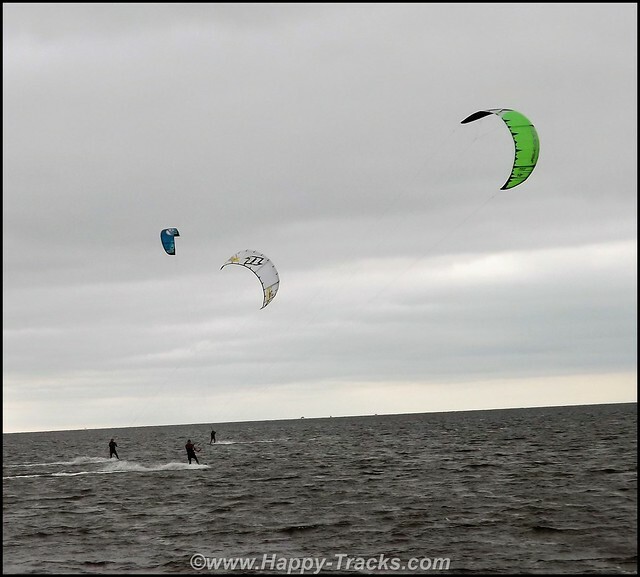 We turned north and drove back up to the Canadian Hole to watch the kite-surfing for a while. 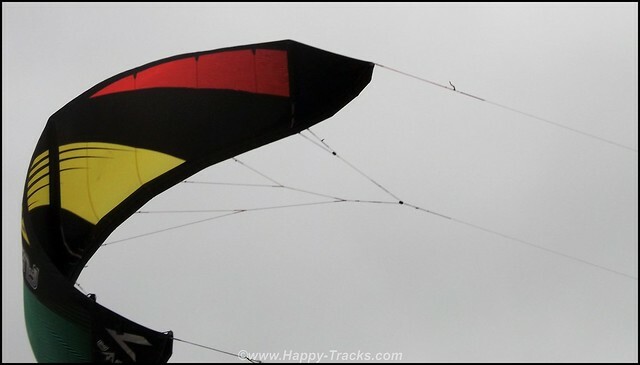 As we watched them setting up, we discovered that the kites’ frames are blown up like a balloon or inner tube. They stiffen the frames by increasing the pressure. So we learned something as well as being entertained for a bit. 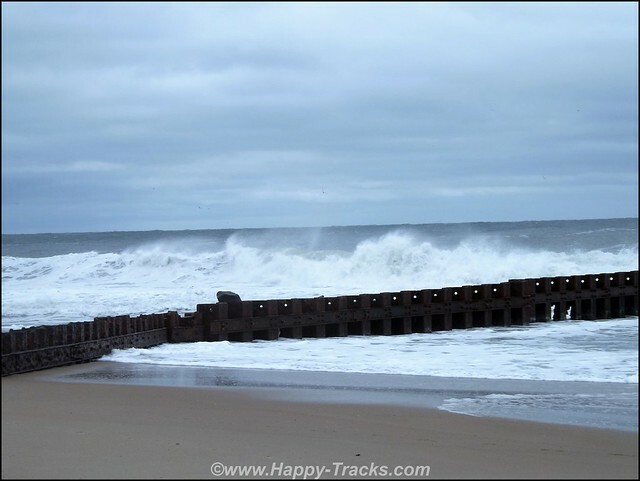 Moving further north, we hit the oceanside beach and rode to the visible part of the wreck of the Pocoantas just offshore. 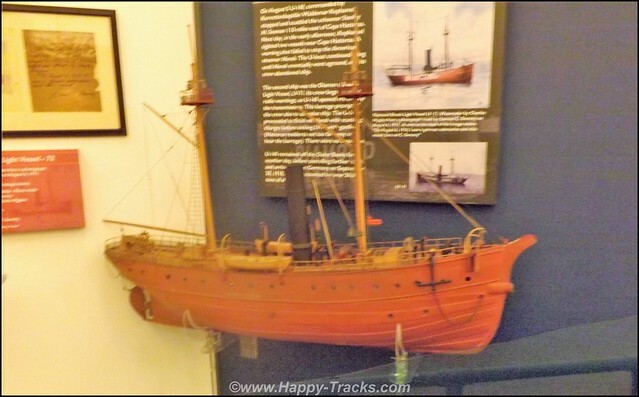 The Pocohontas was a Federal ship involved in the transport of horses for the army fighting the Civil War. Reports vary whether she carried 90 or 110 horses belonging to the Rhode Island Reserves. The Pocohontas was in poor repair and had been battered by the rough seas. In danger of foundering, the captain and crew deliberately beached the wounded vessel after having jettisoned many of the horses at sea. Twenty-four of the horses survived the trip ashore and arrived at Hatteras Inlet the following day with five of the crew. Still visible today is part of the metal supporting structure for the side wheel above the water. The ship is also known as the Richmond. We traveled further north looking for signs of the G.A. Kohler which is sometimes visible above the surfline. The Kohler went aground in a storm in 1933. She was beached above the normal high tide line where she sat for 10 years. The Kohler was a popular gathering spot for the locals, hosting parties and dances on her decks. In the 1940s, the Kohler was burned to enable salvaging the metal for the war effort. The lowest parts of the ship are sometimes exposed but nothing to be seen today. 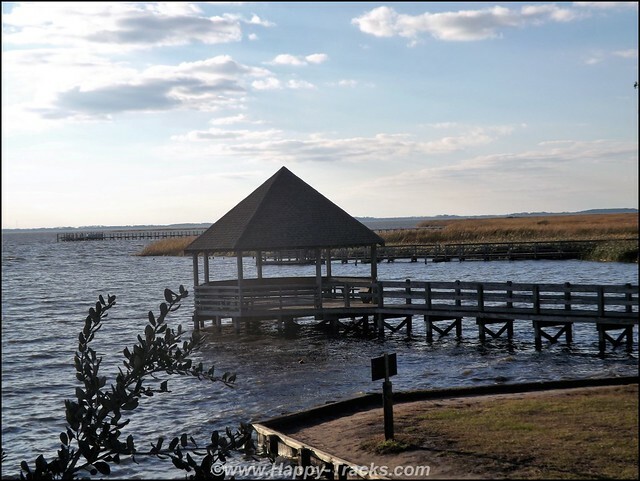 We traveled back to Hwy 12 and continued north through the Pea Island Refuge and over the Bonner Bridge and Oregon Inlet to Ramp 4. 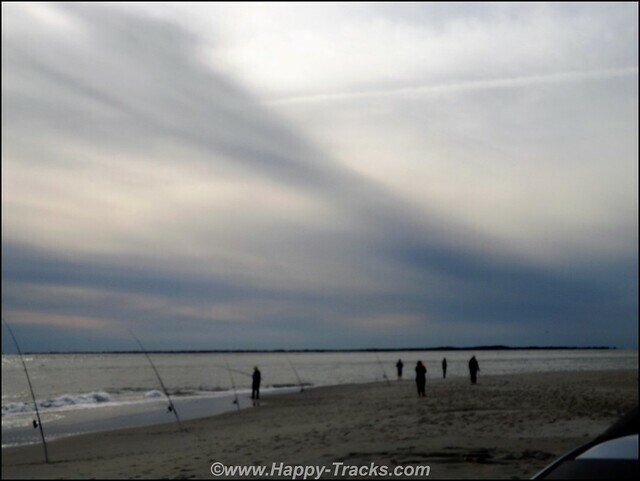 The area at Ramp 4 is the northern side of the Oregon Inlet channel and is popular with fisherman and beachgoers coming from outside the National Seashore. 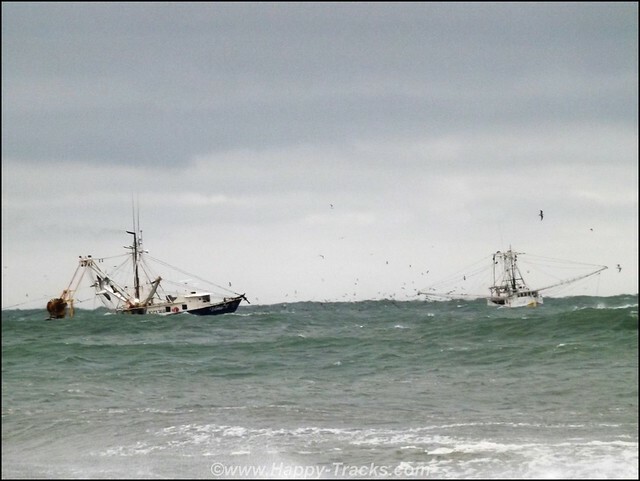 This particular day, there were several fishermen but the area was not crowded at all. 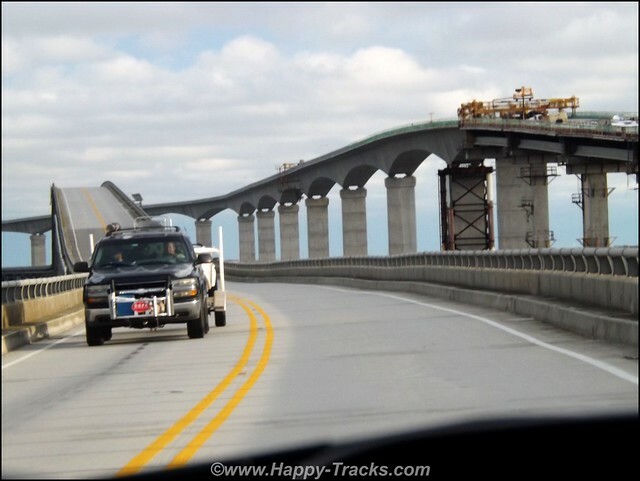 We rode around to a spot almost under the double bridges, the new and the old Bonner Bridge. After some time there, it was time to head south for dinner and back to the motel for the night. 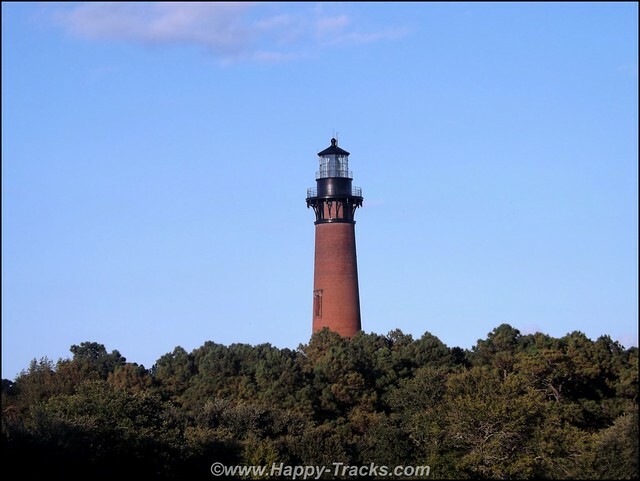 On Sunday after breakfast at Diamond Shoals in Buxton, we made our way north to the Bodie Island Light next to Oregon Inlet. Although the light was not open for climbing this late in the year, the bright sunshine made for some excellent views. 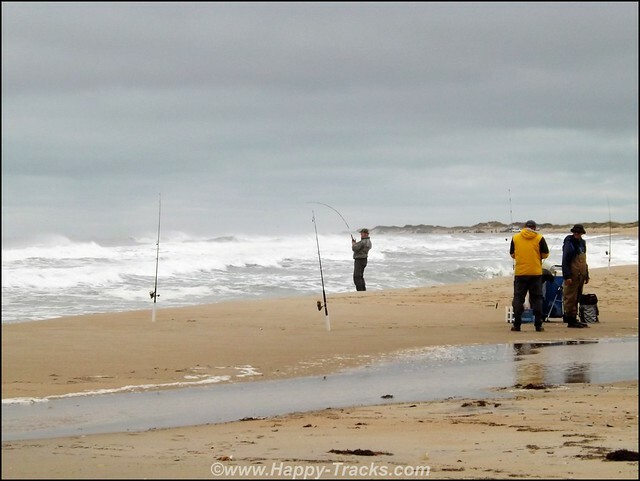 Next we are headed far north to the beach at Carova. We stopped at Uncle Ike’s for lunch and then onto the beaches of Currituck. 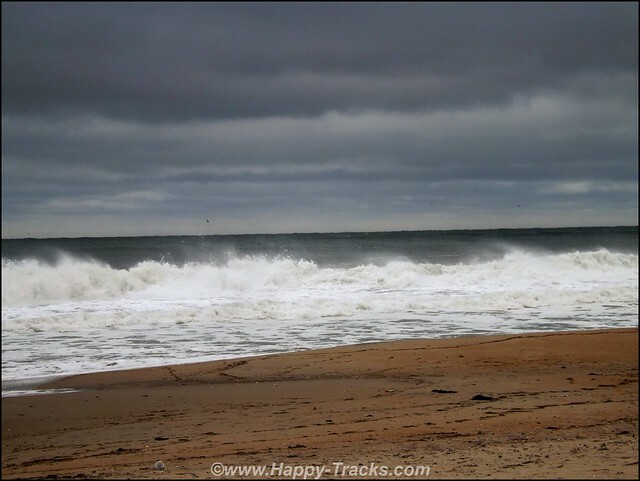 These beaches are not part of the National Seashore. 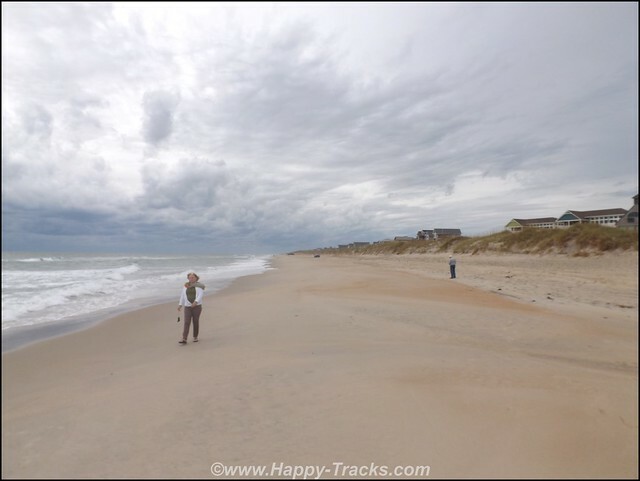 A separate parking pass is required (from Currituck County) to ride these beaches during the summer season but we were late in the year for that. The pass is a new requirement (2018) and is supposed to account for the additional costs to patrol the area and cut down on some of the traffic during summer season. 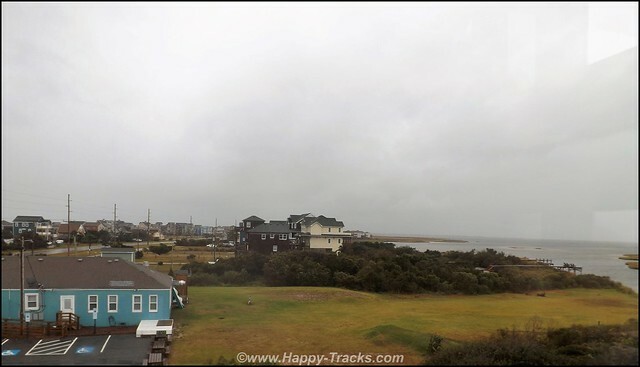 The pass system fees have ontributed to a convenient (and effective) airing station at the old Corolla site next to Currituck Light. (In the past, you either brought your own and risked feeding quarters into ineffective gas station filling machines.) The new restrictions also incude signs that Four Wheel Drive is required as is airing down tires (as opposed to recommended in the National Seashore). In this area, the beach is the main (only) access road to the houses north of where the pavement ends. 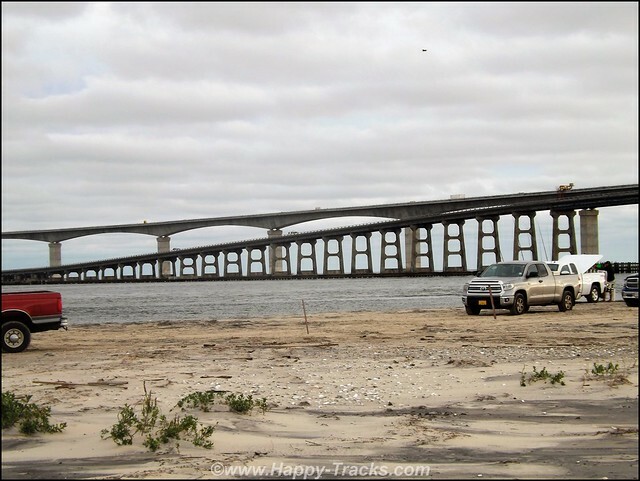 In the 1960s, the development was laid out to eventually connect to Sandbridge VA via a paved road along the coast which never materialized. The road would have needed to go through the Back Bay National Wildlife Refuge. 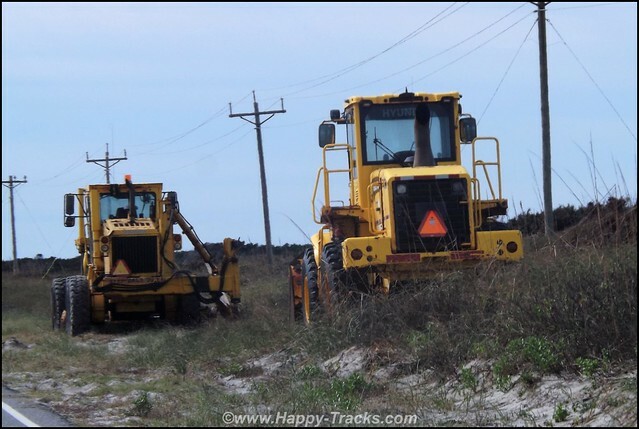 Today, a permanent fence line runs along the boundary of the NWR into the ocean to ensure that vehicles and horses do not pass between the two areas. Oh, did I forget to explain the horses? 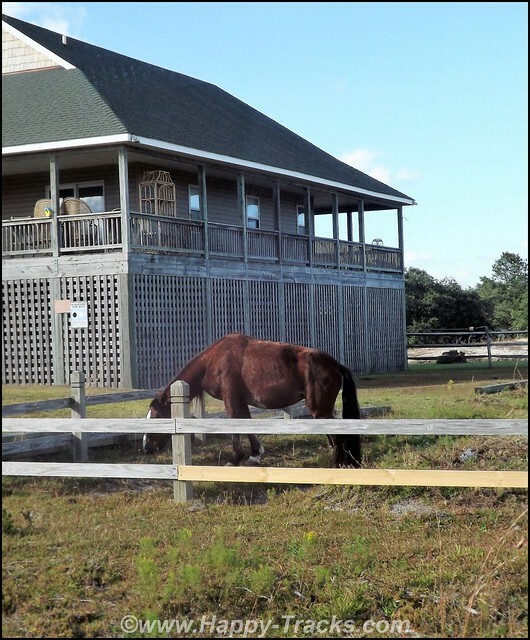 Historically, the horses likely came to the Outer Banks as shipwreck survivors or as freight to help the Europeans colonize the Atlantic Seaboard. They are feral now after generations and limited to the 1800 acres between the fences at Corolla and at the NC/VA stateline. They are protected by law and supported by the Corolla Wild Horse Fund, a non-profit. Protections for the horses include legal minimum distances (sound like a restraining order?) and prohibitions on feeding. While horses may like people food, it doesn’t like them. There are also commercial tours to see the horses running from Corolla. We assured him he was in North Carolina as soon as he had come through the gate. The young man was with his family, a boy about 9-10, a girl around 5-6 who had been on the bike with the man, and a woman. It turns out they had ridden down from where they left their car in Sandbridge, a distance of 10-11 miles. The little girl pointed out the “crab hole” to us in her accented second-language English. 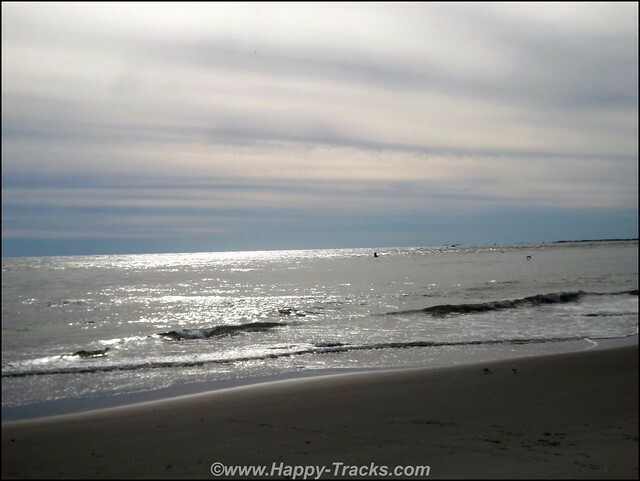 The man asked about the trail and looked as to whether it would be an easier route back north but decided the beach, while softer, was flatter and probably shorter. The man asked about a nearby restaurant where they could feed the kids but we informed him the next town was Corolla, about the same distance as returning to Sandbridge. We didn’t have anything to share but I was concerned about their ability to make it before dark so gave them a pocket LED flashlight. The little girl offered me a potato chip in return, which I accepted. I asked if I could take a picture of them and they were a bit reluctant, asking why and such but consented. I debated sharing the picture here with their faces blurred but decided it was more in keeping with their wishes to just save it for my personal collection. 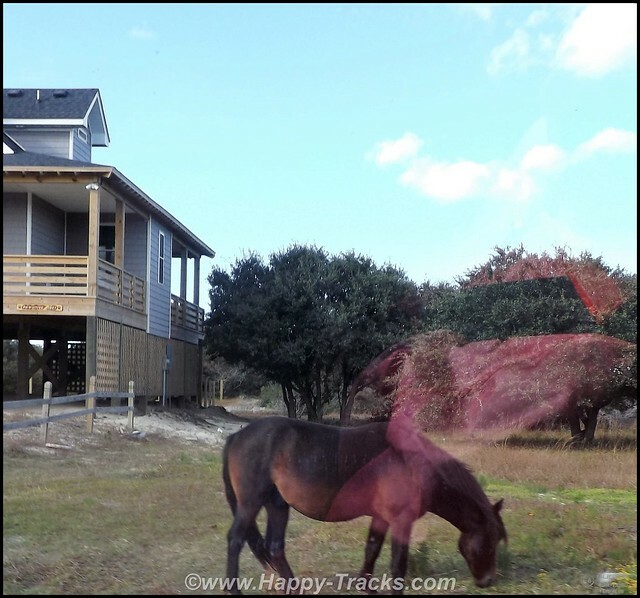 After wishing the biking family well on their travels, we headed off the beach into the houses to see if we could show Carol some horses. They wander about the houses and can often be found near the Carova Beach Townhall and Fire Department building. We passed the firehouse and no horses. Just beyond that though we hit pay dirt. Well, we only found two but it was enough to say we had found them. We headed back out to the beach and south. Along the way, we passed the stumps of the old maritime forest. 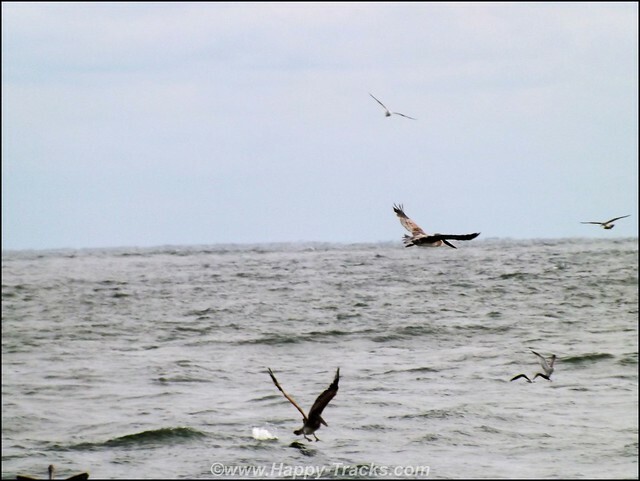 The barrier islands are constantly moving. Some years ago the sand drifted over the forest and killed the trees. 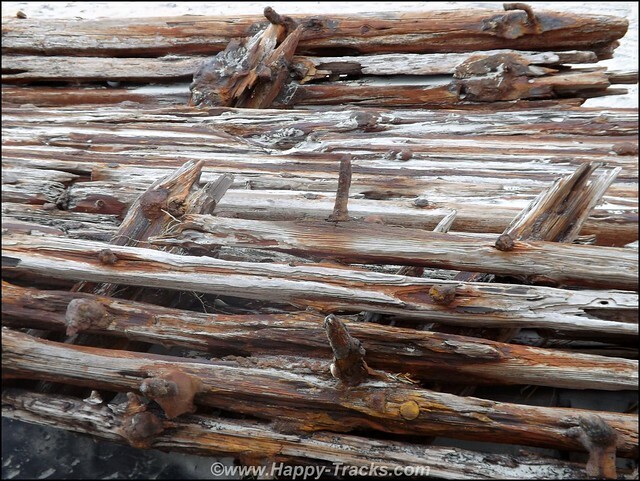 As the island continues moving, it exposed the stumps of the old forest on the beach. 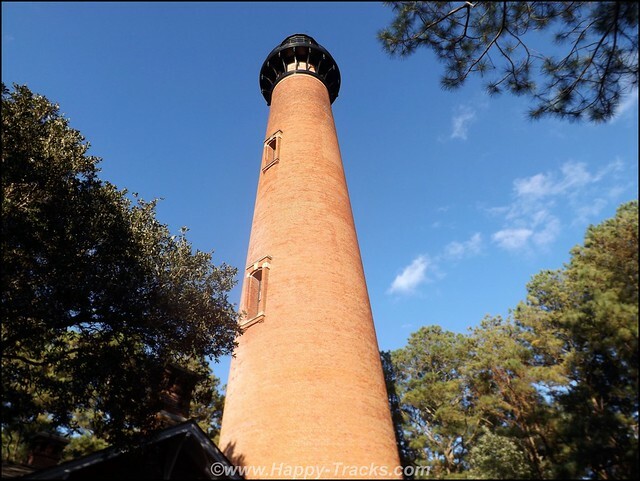 We connected again with the pavement and made our way to the Historic Corolla Village to air up and decided to visit the open Currituck Light. Not enough time to climb before closing but Carol and Paul did go inside and look at the cast iron stairway and some of the fixtures. 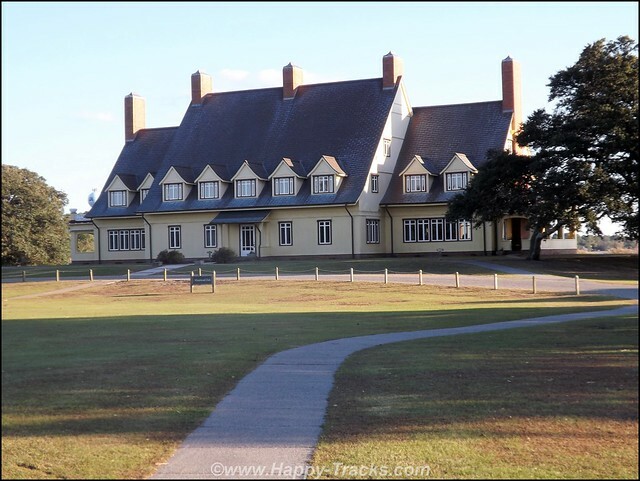 We also walked around the lake and checked out the Whalehead Club from the water. Traveling south into the National Seashore and through the underbrush at dusk, the local deer population was active with several sightings along the way darting back and forth. We managed to avoid any direct contact and stopped for dinner at Oceano’s Bistro in Avon before returning to the Cape Pines in Buxton. Monday morning arrived too early and it was time to head for home after breakfast at Oceano’s again. Our trip home included the mandatory traditional stops at Border Station and also at Pearce’s Pit BBQ in Williamsburg. It had been another great trip with familiar and new friends. Now to wait for spring when we do it again.